If there's anything tremendously positive to write about "The Last Station," it would be how the picture casts an interesting light on celebrated author Leo Tolstoy and the wrath of his final years, in which he morphed into a deity to some of his more ardent Russian followers. It's a convincing portrait of intelligence assuming a greater purpose, though it's trapped in an uneven feature film that starts with a bang and ends with whimper. "The Last Station" deserves accolades for its unusual subject matter, but consistency is a problem for director Michael Hoffman, who's trying to balance a year in the life of a literary legend, but only encourages indifference. 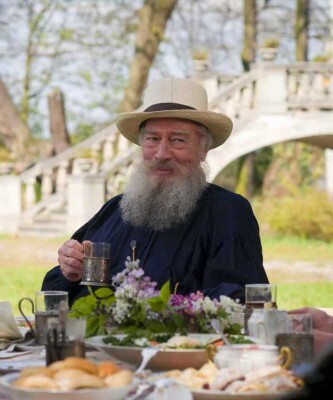 Facing ill health and a growing legion of devout "Tolstoyans," Leo Tolstoy (Christopher Plummer) has retired to his country estate, facing a hailstorm of controversy. Tolstoy's right-hand man Vladimir Chertkov (Paul Giamatti) is after the author's copyrights for such classics as "Anna Karenina" and "War and Peace," looking to exercise the power of the movement by releasing the works into the public domain. Against this act is Tolstoy's wife Sofya (Helen Mirren), a woman keenly aware that Chertkov's plans are not necessarily philanthropic. Thrown into the mix is Valentin Bulgakov (James McAvoy), an earnest Tolstoy admirer who's caught between Chertkov's orders to spy and Sofya's helplessness, while finding his virginity blues cured by a comely Tolstoyan who's lost the faith (Kerry Condon). I must admit, I was completely thrown by "The Last Station" during the opening five minutes of the picture. In a curious move, Hoffman has instructed his cast to speak in their natural accents (or at least a respectable theatrical approximation), which makes this Russian tragedy a bewildering sit for at least a good handful of scenes. Once the diverse tongues have settled, Hoffman's script (based on the Jay Parini novel) kicks in, conveying the sizable jolt of a turbulent life lived in the wake of Tolstoy's colossal fame, cultivated not only through his distinguished writing, but through his crack philosophical mind as well, welcoming a nation of true believers into his sect. The early happenings of "Last Station" revel in the excitement of Tolstoy's presence, as seen through the eyes of Valentin, a green student of the master who's ordered to snoop, but finds himself caught up in the vicious verbal battles waged between Chertkov's agenda and Sofya's incredulity. He's a young man with an awful tell (he sneezes when nervous), but Valentin is our guide into Tolstoy's compound, soon making his way to the man himself. The film's first half is set aside to observe Valentin on his path to liberation, achieved through the fumes of Tolstoy's magnetism and also his sexual maturation, helped along by a woman who challenges his single-minded devotion. Hoffman keeps this section of the film lively with brisk editing and buoyant staging, sustaining an unexpected British pucker to what should be the frost of Russian conflict. In the second half, matters turn grave for the Tolstoy family and for Valentin, as his eyes are opened to the true hand of power in the Tolstoyan army. 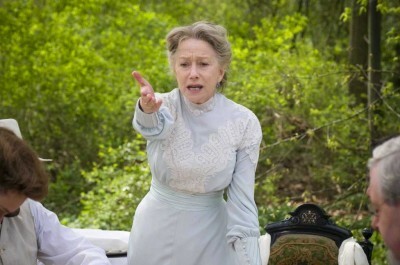 For reasons both known and frustratingly unknown, Hoffman loses control of his picture on the back nine, allowing the drama to become intolerably hysterical, the acting to reach the rafters (Mirren's performance appears to be sponsored by Red Bull and cocaine), and the vivacious energy to dissipate as the horizon darkens for Tolstoy, while Sofya's desperation explodes into teary spasms. There's a thematic purpose to the despair that eventually swallows the film, but Hoffman mismanages the pure energy, removing any desire to learn what happens to these characters by dragging events out to a point of collapse. Tolstoy's inevitable demise is greeted more as sweet release from Hoffman's directorial death grip than a tender finality to a most troubled man. Buy tickets to "The Last Station" now!